It all started as early as when I was five years old. Music ultimately became my second nature. Back then in the early days, although music was enjoyable, not to mention those encouraging pats from family and friends for the informal concerts at every get together, I never imagined that I would pursue it as a career. Things took a sharp turn. That was when the idea of a career in the music was strongly entrenched in my mind. From then on, it was not an easy path. But nonetheless, the musical journey so far has been very much enjoyable and extremely satisfying which makes up many more times for all those lost rewards. One of the proudest moments in my life was singing with Padmashree Dr. S.P. Balasubrahmanyam. In his very own show titled “Ennodu Paatu Padungal” (translates to ‘Sing with me’), which was aired on Jaya TV, I indeed chanced upon to sing with him. Going on to win the show was like icing on the cake. With over 12 years of experience in carnatic music, I sing regularly during the very well known Margazhi Urchavam (December fest) at Chennai. Apart from music, I am also enthusiastic about dance especially Bharatanatyam, the classical dance style of Tamil Nadu. Though I learned Bharatanatyam for about 5 years, my real interest lies in music. Besides carnatic music, I love western classical music. With a few grades on my sleeves in western singing, I currently pursue lessons in western classical style of piano. There are many a people in the world who I should thank for what I am today. For all those accolades and awards, so much of support has been extended by my friends and family. I take this opportunity to express my sincere gratitude to all those who have been extremely supportive of me. Adding her repertoire (learning Hindustani Music from Lakshmi Sriram), Ragini's efforts got rewarded in the inter-state music and All India Talent Hunt competitions in New Delhi. A sought-after talent in various channels, Ragini made the most of her opportunities in Sapthaswarangal, Ragam Sangeetham Raja Geetham, Ragamaliga Bala Brahmam and Apoorva Ragangal. 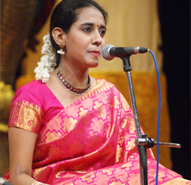 One of her proud moments was in being selected by Tamil Nadu Iayal Issai Nataga Mandram to render concerts in different sabhas and Tamil Sanghams all over the State. Raginisri bascially very good carnatic singer and rendered many live stag performance in various grounds even one in China..Stepped in to Television media when she was doing philosphy through Spb " ennodu paatu paadungal" which turned out to be super duper debut for her in media.. Many postitive feedback from established singer and a trophy at the end bettered her talend. Then came "airtel super singer" in Vijay Tv won many rounds as best singer and a finalist with flying colours. Now she turned as video jockey and occasional Judge. Hope this multi talented person better herself in everything. She dubbed her voice for Ms.Kajal Agarwal in Thuppaki. She also sung one song for the movies Ammavin Kaipesi, Kadhal 2 Kalyanam. She sung a song for the album with A.R.Rehman, G.V.Prakash. Karur Krishnamoorthy, who was my first Carnatic music teacher. I started learning from Late Mrs. Sulochana Pattabhiraman fondly known as “Maami”.